IJM Land Bhd has become the latest developer to launch a promotion to woo house buyers, an indication of how the slowdown has hurt consumer spending on big-ticket items. Rivals like SP Setia Bhd, Mah Sing Group Bhd and Sime Darby Properties have unveiled schemes that range from low down payments to a guarantee to buy back the property. While the schemes may attract buyers, developers are also sacrificing part of their profit with such campaigns, analysts said. IJM Land managing director Datuk Ir Soam Heng Choon said people should take advantage of low interest rates to buy property. "We are not sure what could happen in the future. Anybody could speculate and say prices may go down further towards end of the year but no one knows for sure," he told reporters in a briefing in Kuala Lumpur yesterday. 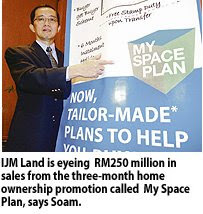 IJM Land hopes to make RM250 million in sales from the three-month home ownership promotion called "My Space Plan" that started yesterday. The incentives include down payment from as low as RM500, low interest rate for the 5:95 payment scheme, no interest during construction period and up to six months instalment holiday. The programme covers all existing and new development under IJM ranging from middle- to high-end projects. "Rather than offer a one-scheme for all, we have improvised a flexible homeownership plan according to their financial abilities," Soam said. Depending on the economic situation, the group hopes to launch about 10 new projects this year with a total gross development value (GDV) of between RM700 million and RM750 million. "It depends on the market. If market softens further, we might relook at the timing and hold back some of the launches," said Soam. IJM now has 3,237ha of land with a total GDV of RM17 billion. SUBANG JAYA: IJM Land Bhd hopes its newly launched home ownership package, My Space Plan, will rake in RM200mil to RM250mil sales in three months. Managing director Datuk Soam Heng Choon said the new plan was applicable for the company’s existing and new property projects. “This plan will cater to all our buyers as we want to help potential buyers or investors during these difficult times. Although some developers have already come out with their own promotion packages, our unique tailor-made home ownership plan with additional incentives will appeal to those looking to own properties,” he said yesterday after the launch of the plan. Among the incentives under the plan are low downpayment from RM500, cash rebates up to a maximum of 10%, low interest rates for the 5:95 payment schemes and 0% interest during a project’s construction period. Soam said the current economic situation should not deter Malaysians from purchasing their own homes. He said although the current property market was softening, he believed developers could still sell their products with the right products and good location. This year, IJM plans to launch more than 10 new projects worth about RM750mil in Penang, the Klang Valley, Johor and Sandakan, Sabah. “However, the launches will depend on market conditions. If the market turns softer, we will review a launch and not simply go ahead with it,” Soam said. IJM still has about 8,000 to 9,000 acres with potential gross development value of RM17bil that would take 20 years to be developed. Currently, IJM’s property projects are located in Penang, the Klang Valley, Seremban 2, Sabah and Sarawak. WCT Bhd, Malaysia's biggest construction and property development group, aims to secure RM1 billion worth of new projects in Malaysia and the Middle East this year. The group, with RM2.6 billion order book as at December 31 2008, is now positioning itself in three major markets - Malaysia, Vietnam and Middle East. "In spite of the slowdown in Middle East markets, there are still opportunities in countries such as Oman and Bahrain. "Major cities such as Dubai where development has reached its height could be experiencing some slowdown," she said during the Malaysia Services Exhibition 2009 which ended in Dubai recently. 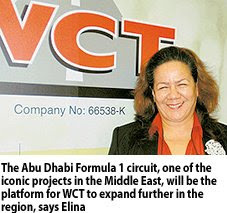 Elina said it was crucial for WCT to position itself and strengthen its foothold in the Middle East market in view of more opportunities when the economy recovers. "The circuit will be completed in August in time for the race in November," she said. The project, costing 3.3 billion dirham (100 dirham = RM102.10) is reputed to be the world's most modern and finest F1 circuit, with a 50,000 spectator capacity. In Malaysia, Elina said WCT was busy with several projects - the office and commercial buildings in Putrajaya due for completion in 2010 and Paradigm Petaling Jaya Grade A offices and shopping mall, Malaysia's most modern commercial development. The Paradigm, to be completed in 2014, has a gross development value of RM1.4 billion, she said. Other ongoing projects in Malaysia are civil work at the Kota Kinabalu International Airport in Sabah and Bakun hydroelectric dam in Sarawak. SINGAPORE: Singapore's home prices plunged 14 per cent in the first quarter, the most in at least 16 years, as the global financial crisis and a recession deterred buyers. The price index of private residential property fell to 140.3 points in the three months ended March 31 from 162.8 in the previous quarter, the Urban Redevelopment Authority said in an e-mailed statement yesterday. That's the largest drop since the first quarter of 1993, according to the earliest data provided by the government agency. Residential prices have retreated for three straight quarters, ending a four-year rally. The island-state's trade ministry has forecast the economy may shrink by as much as 5 per cent this year, the largest contraction on record, amid the worsening global recession. "Developers have already made a quantum leap in reducing prices in the first quarter and although further declines in launch prices can be expected, the incremental drop is likely to be marginal and more gradual," Tay Huey Ying, Colliers International's Singapore-based director for research and advisory, said in an e-mail. "The overall residential property price decline for 2009 is forecast to be in the region of 25 per cent to 30 per cent." Prices for private homes in the so-called core central area dropped 15 per cent last quarter and retreated 17 per cent elsewhere in central Singapore, according to the Urban Redevelopment Authority. They fell 7.5 per cent across other parts of the island, yesterday's statement showed. The data is based on transactions in the first 10 weeks of the quarter, the government agency said. It will provide an update in four weeks. COUNTRY Heights Holdings Bhd’s 70 per cent subsidiary Borneo Heights Sdn Bhd is joining hands with Cougar Properties Sdn Bhd to construct, promote and market Borneo Highlands Resort & Golf course and eco-friendly and luxury villas in Kuching, Sarawak. Borneo Heights, being the landowner, will procure all the necessary approvals and permits for the development of the villas while Cougar Properties has agreed to secure a minimum total sales value of US$160 million (RM584 million) for the villas. IOI Corp Bhd had on March 31 announced that it holds approximately 742.328 million ordinary shares of 50 sen each representing 91.33 per cent of the issued and paid-up capital of IOI Prop as a result of acceptances received under the voluntary takeover offer by IOI Corp. Therefore, the public shareholding spread of IOI Prop as at March 31 has become less than 10 per cent, MSWG said in a statement. IOI Corp does not want to maintain the listing status of IOI Prop. MSWG said the minority shareholders who want to hold on and willing to ride along with the IOI Corp even if IOI Prop is delisted will still benefit from IOI Prop's performance in the long run. Those who wish to remain in the unlisted entity of IOI Prop will have three consequences, MSWG said. They will be locked in the unlisted IOI Prop with limited exit strategy for their unquoted IOI Prop shares held. They could also be entitled to dividend payments declared by IOI Prop to IOI Corp in the future. However, it is at the board's discretion to declare dividends. The rights of the minority shareholders in the unlisted IOI Prop will still be regulated under the Companies Act 1965.